Welcome to the Economic Development Council of Buffalo County’s (EDCBC) premier business web site which was launched for the purpose of economic development. Within these pages you will find all the information necessary to access the opportunity that our communities have to offer. 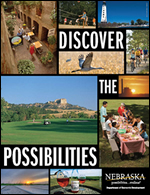 If you desire to relocate your business or would like to start one up, our communities and county offers the salient things that every organization needs to succeed, plus much more. Kearney, Ravenna, and Gibbon are just a few of the communities that make-up Buffalo County, the 2nd least stressed county in the United States (Associated Press). This area has a unique and well balanced economy and many refer to it as a “six legged stool.” It is inclusive of post-secondary educational opportunities (University of Nebraska at Kearney and Central Community College); a strong health care system (Good Samaritan Health Systems and the 120 plus physicians in the community, often referred to as the Outstate Medical Center); farming, ranching and agriculture related industries (Agriculture); manufacturing (Industry); convention and tourism, and a strong retail business sector. The makeup of the six legged stool is such that one leg can be broken and the other five will support the economy of the community making it recession proof. Add to this the many cultural opportunities, athletic events, things to do, and a work force that is predominantly the 2nd and 3rd generation of farm families with a tremendous work ethic, and you have an area that is highly desirable to do business in. Added to the desirability is the accessibility of Kearney and Buffalo County. Interstate 80 and the mainline of the Union Pacific Railroad span the southern border of Buffalo County and extend nationally to the transportation hubs and coastal regions. Burlington Northern also provides rail access in the northern communities of Buffalo County. We are only one hour by way of local commercial air service to the 4th largest airport in the U.S. (and the 11th in the world), the Denver International Airport. Our central U.S. location and points of access make transportation or travel to any place in the U.S., or in the world for that matter, fast and convenient. The communities in Buffalo County pride themselves on being “pro-business” and are strong supporters of economic development. Our governmental entities are investors in the Economic Development Council of Buffalo County and over 40 other local private investors. Many successes have been achieved over the past 25 years because of the partnerships that have been developed with the private and public sector, and the importance that has been placed on economic development. Despite the national recession that began in late 2008, the area has still had a strong growth and boasts of many new housing starts, the passing of a $28 million bond issue to build two new schools, a new public library, a new convention center, a 240,000 square feet distribution center for The Buckle, a 71,000 square foot addition for a local food distributor, a new airport terminal, the beginning development of a 200 acre technology park, a $65 million addition to the Good Samaritan Hospital, the construction of a second hospital, the final development of an 80-acre public park, the construction of a million dollar senior center, and many improvements to the local infrastructure. 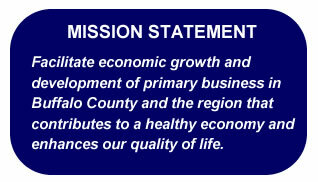 The Economic Development Council of Buffalo County recognizes that its mission is to help perpetuate and facilitate the growth of existing businesses and be available to help new businesses in every stage of development. Our staff has already helped Gibbon, Kearney, Ravenna, and Buffalo County businesses expand or operate more efficiently. We are also working to bring varied and innovative new businesses to the area including food processing, advanced manufacturing, distribution/logistics, back office-fulfillment centers and data centers. The EDCBC is here to help. Our board of directors meets every month to discuss current issues and how we can meet our goals. We hope to make this web site a forum for innovative ideas, information dissemination, and keeping our citizens interested in EDCBC activities. We welcome your comments and input. I am confident in Buffalo County’s future and pleased to offer the services of the Economic Development Council of Buffalo County. I look forward to meeting with you. Copyright � 2008 Nebraska Public Power District. All rights reserved.